This Shawarma Spiced Chicken Sheet Pan Dinner recipe and post was made in partnership with Pompeian. We received product and compensation in exchange for it. Opinions are always our own. If we don’t love it, you don’t hear about it. Thanks for your continued support! 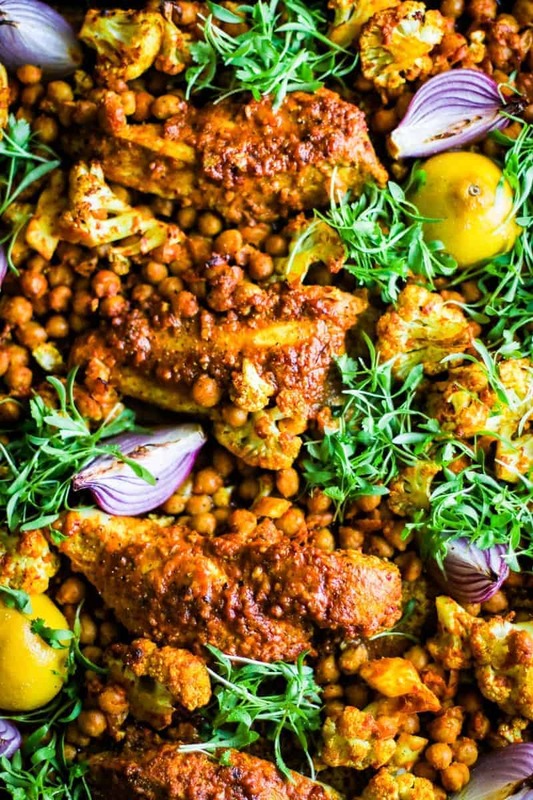 It is no secret that I love taking my family’s tastebuds on a trip around the world at the dinner table and my latest recipe for this Shawarma Spiced Chicken Sheet Pan Dinner was inspired by the flavors of the Middle East! I’m sure you’ve seen traditional Shawarma at Middle Eastern restaurants before. But, just in case you haven’t let me fill you in on exactly what it is. Typically a type of meat like chicken or lamb is marinated then placed on a rotating vertical spit and grilled, sometimes for as long as a day, before being shaved off into thin slices for serving. Since I don’t have a spit to roast on or an entire day to prepare dinner I’ve changed up the process quite a bit, but don’t you worry because the flavor is still all here! My simplified homemade version of chicken shawarma comes together in just about 45 minutes, with only 15 of those minutes being hands on. 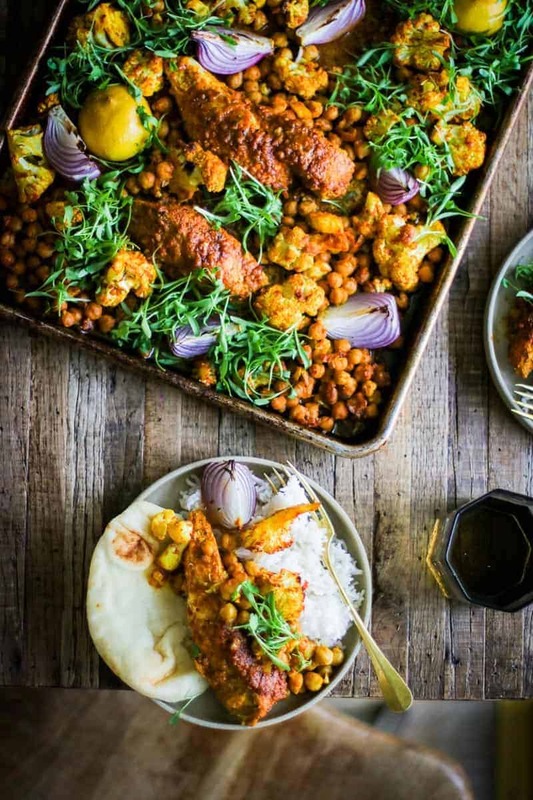 It is packed with some of my favorite warming spices that are used a lot in Middle Eastern cuisine, like cumin, coriander, cinnamon, paprika, turmeric, and aleppo pepper making this meal rich and decadent. 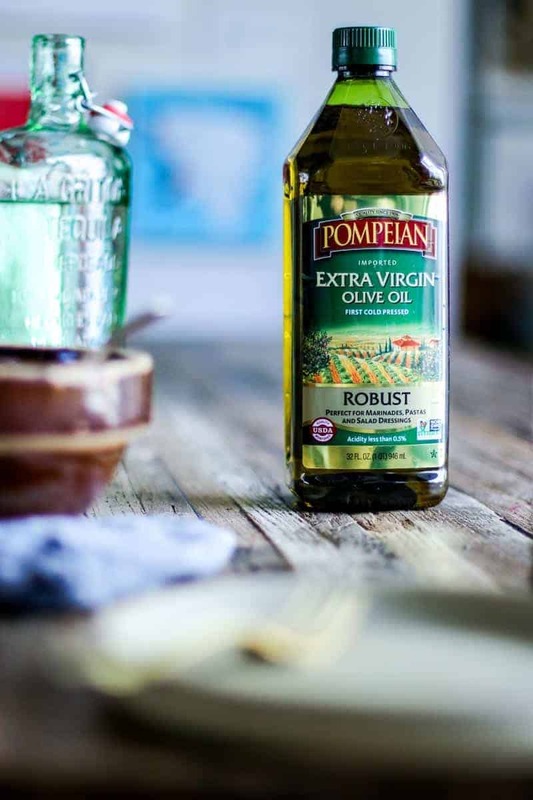 Plus, thanks to a healthy pour of Pompeian Robust, Extra Virgin Olive Oil in the marinade the chicken and vegetables roast to a perfect golden brown exterior while still staying moist and tender on the inside. Normally when we share recipes as a part of our meat + three post series we give you 3 vegetarian main options that can be served alongside your meaty meal for the plant based eaters at your table. But, since I created a vegan version of this shawarma for you as well I decided to swap it up and pair this Shawarma Spiced Chicken Sheet Pan Dinner, with 3 sides that I love serving with it. Scroll down past the recipes for the pairings! While the kids and I love this meaty version, my vegetarian husband is a HUGE fan of my Vegan Sheet Pan Shawarma. They have practically the same ingredients and cook in the same amount of time, at the same temperature. I often make both versions at the same time and we feast on leftovers for lunch the next day. To make both, simply place the sheet pan with the chicken on a lower rack in the oven and the vegan sheet pan supper on a rack that is in a higher position. This will keep any chicken splatters away from the vegan friendly dinner. Optional garnishes: cilantro or micro green cilantro, crumbled feta, sliced green onions. Preheat oven to 400°F and line a 13″ x 18″ baking sheet with parchment paper. In a large mixing bowl combine the lemon juice, Pompeian Robust Extra Virgin Olive Oil, garlic, salt, pepper, cumin, coriander, paprika, turmeric, aleppo pepper flakes, and cinnamon. Whisk to combine. Divide the marinade into 2 bowls. Add the chicken to the first bowl, tuning to coat each piece in the marinade. Set aside. 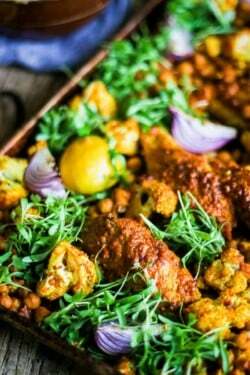 Add the cauliflower florets and chickpeas to the second bowl, turning the ingredients together with a large spoon or tongs until all of the vegetables are coated. Arrange the chicken on the sheet pan first, spooning any remaining marinade from the bowl on top of the pieces of chicken. Next, add the seasoned cauliflower and chickpeas to the pan around the chicken. Layer in the onion quarters and place the 2 lemon halves, cut side down on the pan, one near the top and one near the bottom. Bake for 25-30 minutes or until the chicken reaches 165°F and the vegetables are tender. To serve, squeeze the roasted lemon halves over the chicken and vegetables then garnish with desired toppings. Serve immediately. If you don’t have a sheet pan that is as large as the one I use you can use 2 smaller sheet pans and divide the ingredients between them. 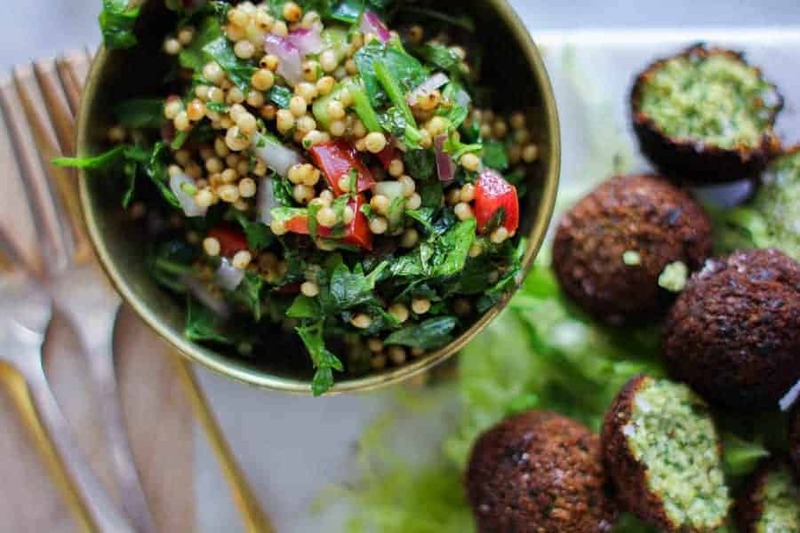 Sorghum Tabbouleh || You cannot go wrong serving this vibrant tabbouleh along side our Shawarma Spiced Chicken Sheet Pan Dinner. It’s fresh, bright flavors really set off the flavors of the shawarma making for one heck of a memorable meal. 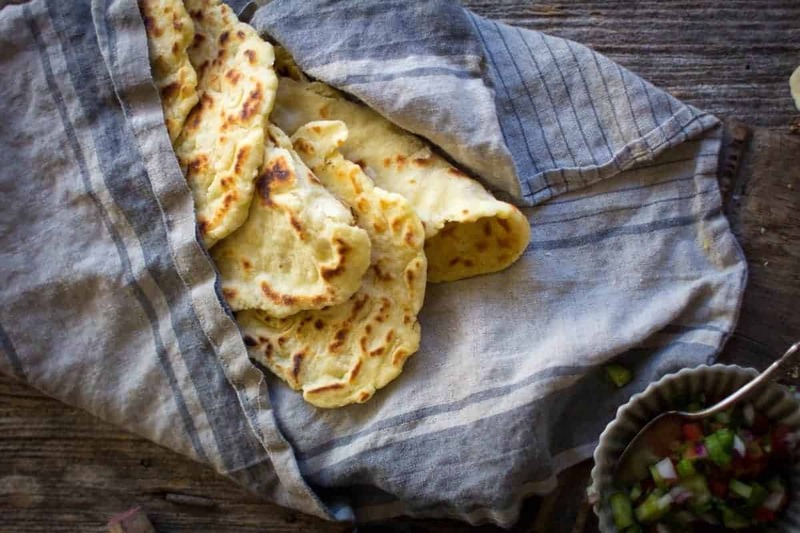 Gluten Free Roasted Garlic Naan|| When you order a traditional Shawarma meal it is served wrapped in naan and this Shawarma Spiced Chicken Sheet Pan Dinner should be no different. Ok, I guess you can totally serve it without it, but I assure you that you will be missing out if you don’t try it at least once! 5-Minute Hummus || You can’t have this Shawarma Spiced Chicken Sheet Pan Dinner and Naan without hummus..you just can’t! 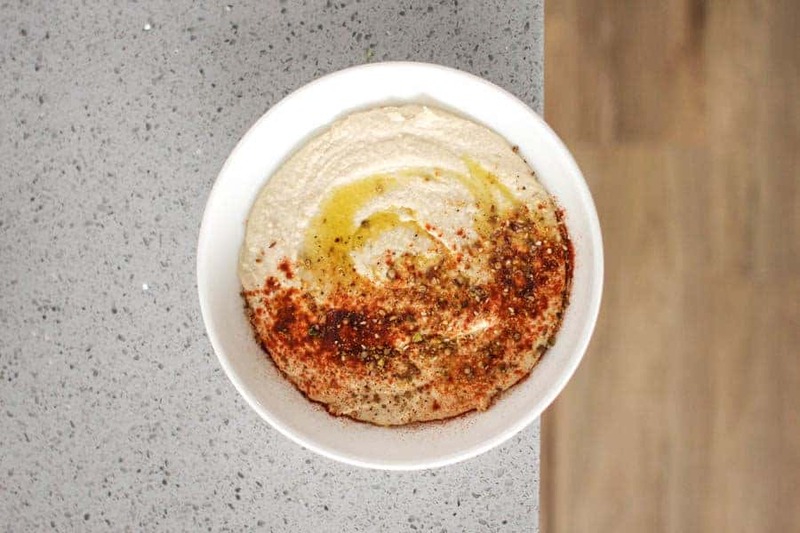 Whether you buy a tub of premade hummus at the store or you invest 5 minutes of your time and make hummus at home, just do it! You will not regret it!